Although there was a nine-year gap in between Pikmin 2 and this sequel, Pikmin veterans will feel right at home with Pikmin 3, and newcomers will be delighted to find that it serves as a great introduction to the series. Pikmin 3 overcomes the large gap in between releases by being accessible to gamers of all ranges of experience with the series, in the process delivering the deepest Pikmin title yet. Longtime Pikmin fans will notice the absence of series protagonist Captain Olimar. In his place are three new characters: Alph, Brittany and Charlie, who travel to the Pikmin planet to bring fruit and seeds to their starving home planet of Koppai. Olimar still finds his way into the plot, with his notes on the planet’s wildlife (primarily the Pikmin) being conveniently strewn about the environments, giving players mini-tutorials in the process. In order for the three heroes to gather the fruit they need, they of course require the help of the Pikmin found on the planet. The original three Pikmin types return with their abilities intact (Red Pikmin are slightly stronger and immune to fire. Blue Pikmin can swim. Yellow Pikmin are immune to electricity and can be thrown higher than the others). They are now joined by two brand new Pikmin types: Rock Pikmin and Winged Pikmin. 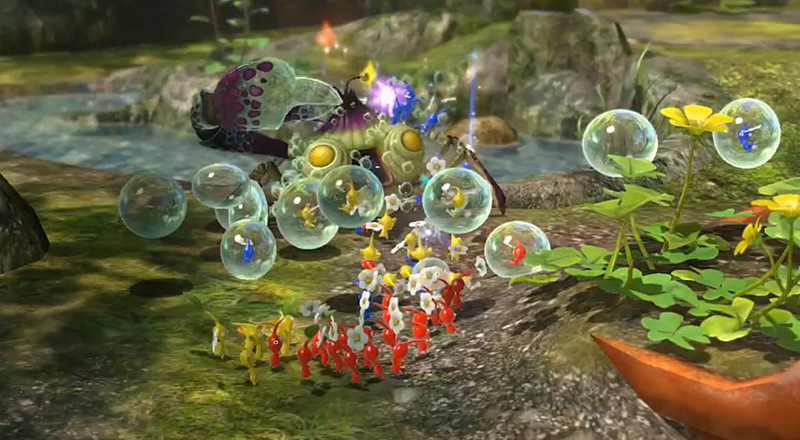 The Rock Pikmin can be used to break away tough obstacles and daze enemies with a sucker punch-like first strike, while Winged Pikmin, as their name suggests, can fly. The two new Pikmin types add an interesting dynamic to the gameplay, and their additions mean that plenty of the game’s puzzles take full advantage of their abilities (as well as those of the returning Pikmin). 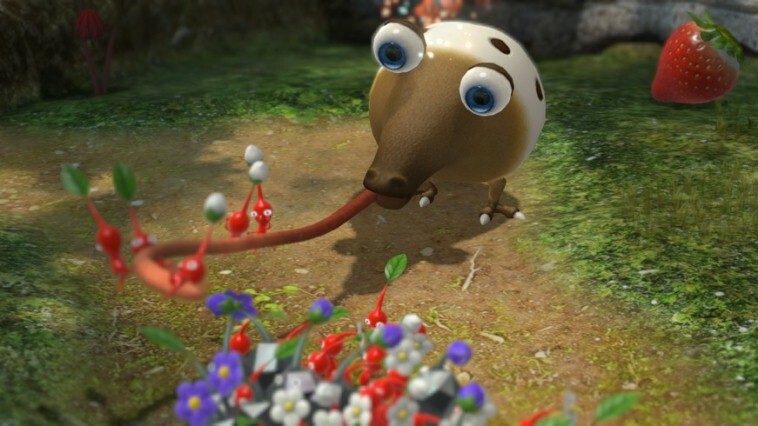 Pikmin 2 fans might be disappointed that the powerful Purple Pikmin and poisonous White Pikmin aren’t to be found in the game’s story mode, but rest assured they do make appearances in Pikmin 3′s mission mode and multiplayer Bingo Battle. 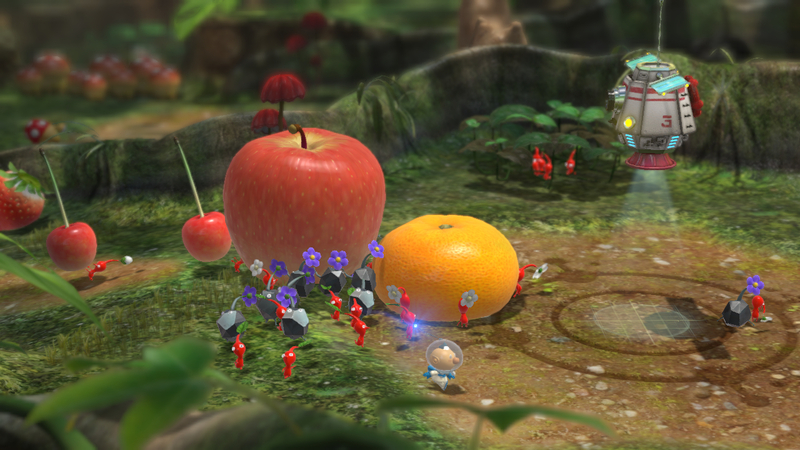 Pikmin 3 retains similar gameplay to its predecessors. You still pluck Pikmin from the ground, gather pellets to gain more troops, solve puzzles, and fight large (and some not-so-large) enemies. 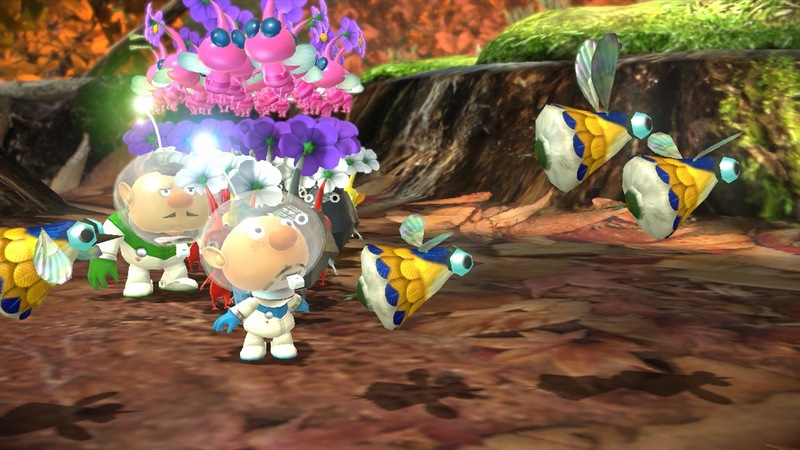 So Pikmin 3 doesn’t exactly reinvent the series, but it does refine it. Calling your Pikmin from their Onion (the Pikmin spaceship) at the beginning of each in-game day has been streamlined. Instead of each Pikmin type having their own Onion you have one big Onion, which gains access to each new Pikmin type as you discover them. Scheduling the aforementioned in-game days is easier than ever. The days and nights still go by, and you still have to make sure your Pikmin are either in their Onion or in the presence of one of the three characters before the sun sets (lest they get eaten by beasties), but Pikmin 3 lacks the 30 day time limit of the original game, and it leaves behind the dungeons concept of Pikmin 2, which makes it a bit easier to plan out each individual day in the game. 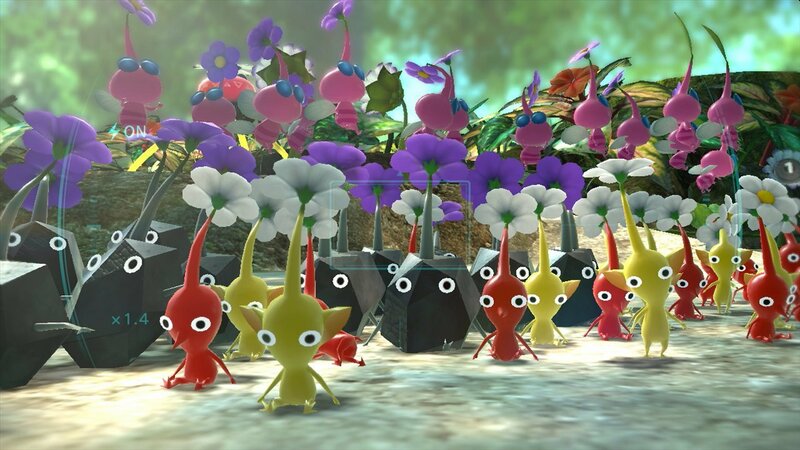 Go gather a few pieces of fruit one day, maybe go after a boss the next, or just spend a day building your Pikmin army. In terms of its core gameplay Pikmin 3 has pretty much fine-tuned the best aspects of the series, and trimmed the fat of its predecessors. Combat is still as fun as ever, even if it may not be as much of a focus as it was in Pikmin 2. 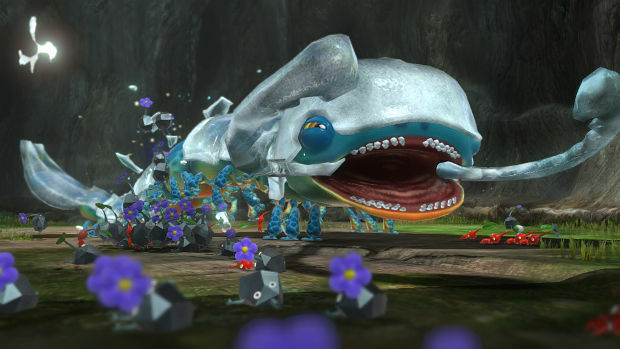 The beasts that inhabit the Pikmin planet are a bizarre range of creatures that showcase Nintendo character design at its most creative. Each monster you come across presents its own little puzzle. Some will be more obvious (if its a slug made out of fire, use the Red Pikmin), while others will be more strategic (such as a giant enemy crab that requires hefty Rock Pikmin to break its claw, and Blue Pikmin to attack it from the back when in submerges itself). The character design alone is a thing of beauty, the fact that Nintendo was creative enough to bring out all aspects of Pikmin 3′s gameplay through its bestiary just makes it all the more fun. It should be noted that Pikmin 3 was the first Nintendo game to really take advantage of the Wii U’s HD capabilities. Yes, New Super Mario Bros. U and Nintendo Land were pretty enough to look at, but the former stuck too close to the established aesthetics, while the latter purposefully used a more simplistic approach to its visuals. But Pikmin 3 is the first in-house Nintendo game to really take advantage of HD, and it looks gorgeous. Lush environments, eye-popping colors, lovingly crafted details, every inch of Pikmin 3 is simply pleasing to the eyes. It’s hard to think of very many HD games that are half as colorful as this. Pikmin 3 is equally pleasing to the ears. While its soundtrack may not be as instantly infectious as Mario or as emotional as Zelda, Pikmin 3′s score is elegant, atmospheric, and very fitting to the nature of the game. The music is calm and chirpy in the game’s sun-drenched locales, but becomes bombastic and epic during one of the (often difficult) boss fights. Pikmin 3 admittedly has a couple of small drawbacks that should be addressed. The first is the most obvious. The Wii U Gamepad – while effective in the control of the characters and in providing players with a map (complete with RTS-style fog of war) – provides some control issues in regards to aiming. You may find it difficult to accurately throw Pikmin on a flying foe, and it can feel a bit awkward trying to toss Pikmin in high to reach places. Pikmin 3 gives you the option to play with a Wii remote and nunchuck combo, which may actually be a better means of control all around. You can’t be too hard on Pikmin 3 for not being the best showcase of the Gamepad though, as the game had been in development for the Wii for years before being moved to the Wii U.
There’s also the issue with the Pikmin AI getting a little “confused” at times. You may find that a few Pikmin have gotten lost somewhere on the map more often than you’d like. Some may also cry foul at the rather short length of the story mode after having waited so long between sequels, but while the adventure may be compact, Pikmin 3 makes the most of everything it has to work with. But these are small complaints when the whole package is this engaging. If you have any friends over you can enjoy a game of Bingo Battle, in which two player armies try to gather the objects from a bingo card in order to gain that ever-elusive bingo, all while hindering the other player – Mario Kart style – with a host of items and power-ups. Mission Mode provides additional replayability, with missions asking players to put their skills to the test and clear an area of collectible items, defeating all enemies on the map, or besting one of the game’s bosses in the fastest time. When all is said and done, Pikmin 3 is not just a welcome and long-awaited return for the series, it’s the most refined and balanced – and all around best – entry in the Pikmin series to date. Although seeing the ghosts of fallen Pikmin may teeter on depressing, Pikmin 3 represents Nintendo’s knack at making games that exude charm, deep gameplay and, dare I say, magic. We may have waited nine years, but it feels as though Pikmin never went anywhere. The fruit looks so good it makes me hungry! Amen to that! Never before have I craved a glass of OJ so much as when I play Pikmin 3.